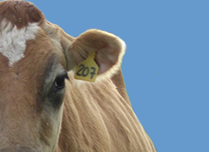 When we established St. Brigid’s Farm in 1996, we started with 69 registered Jersey heifers. Our herd has grown to 200 animals consisting of milking cows, replacement heifers, steers and veal calves. Every year we sell surplus dairy cows as well as grass finished Jersey beef and meadow veal. The 62 acre farm, located on the scenic eastern shore of Maryland, is planted in permanent pasture, comprised predominantly of perennial rye grass and clover. The seasonally calved herd intensively grazes from April through November. Milk from our outstanding Jerseys is marketed through our cooperative, Land O’ Lakes where it is turned into cheese, butter, and non-fat milk powder. Each one of our cows produces about 2,250 gallons (19,500 lbs) of milk per year which is exceptionally rich in butterfat and milk protein. 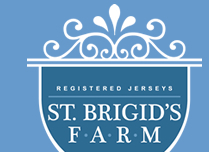 St. Brigid’s Farm consistently ranks with the top tier herds in the nation on the Jersey Performance Index list. Grass fed Jersey beef and meadow veal is sold directly to individuals and restaurants to offer consumers a delicious and healthy alternative to the options at the supermarket. It thrills us to have our Jersey beef offered on the menu of our favorite local restaurant, Luisa's Cucina Italiana, and to have local residents stop by to purchase steaks, roasts, burger or chops for their next cookout or family dinner. The pairing of a dairymaid and scholar has resulted in a beautiful farm which produces high quality milk, beef, veal and dairy stock. Stop by anytime for a real life visit.